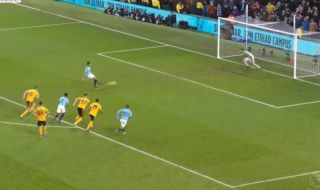 Manchester City striker Gabriel Jesus has scored again to make it 2-0 against ten-man Wolves in the Premier League this evening. In truth, this game looks all over as a contest already, with City in complete control and with the visitors now forced to play a long period with just ten men after Willy Boly’s red card. Jesus made no mistake after Raheem Sterling was brought down – even if the England international did look to hit the floor a little easily. Jesus, however, was ice-cool from the spot to double City’s lead and put this game beyond doubt.